With the attention we pay to features at Budd Baer Mazda we consider the design of the vehicle to be a feature in and of itself. We look at the exterior and interior of the design of a vehicle because we are aware of the effect that the design can have on the ride as s whole. 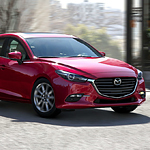 The example of a good design is the 2018 Mazda3. The design of the exterior is known as Kodo or "soul of motion. Therefore, the vehicle is designed with idea of motion. Even when the Mazda3 is not moving, you get a sense that it is in motion. In order to support the motion of the vehicle, the 2018 has designed seats in ways that it molds to your body. This maximizes comfort during times of motion. One of the features that factor into the comfort of the road is the perforation of the seats. You will experience a comfortable ride of an extended length of time.